As time goes by, we can see many things changing gradually but surely. Not only that, we can even see new things coming into our growing digital world from time to time. Yes, that’s what it means to live in a modern world. For that reason, we are required to adapt to new things and adjust to anything in this era, especially if we are living the life of a business person. If you are a business owner, your mind is required to adjust to new things and to be always on the move. In short, in this modern world, you need to have a modern mind. Though it doesn’t necessarily mean that your need to completely leave the traditional things, you have to think like how the modern people think. For example, we know for a fact that a business needs a website. But it doesn’t stop there; a website needs its web design. And that web design, of course, needs a lot of improvements in a world where almost everything constantly changes. For that reason, there are many modern web design elements made for improving a website – those new trends. 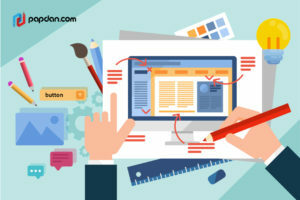 New trends in web design are made for helping people create a new look for their website and branding so that the website has different and unique style to tell stories and explain the company behind that website. That being said, it doesn’t mean that we have to include every trend that comes about on our website. With so many options to choose from, it can be tough to decide which ones are really worth considering. But don’t worry! I’m here to help you narrow down the most important modern web design elements for your business through this article. Keep reading to find out! Every company has a specific font or typography that they use for differentiating their company from their competitors. This font is what defines the company’s branding and identity. In recent years, designers have received a larger selection of fonts to choose from, making it easier for brands to more accurately express themselves through typography. Aside from branding and making your company unique, typography can also help “lead” your website visitors to the specific page they want to see. Creating unique and large typography is also a part of making your business branding more standout among your competitors. However, make sure the size of the font you choose supports any browsers and devices so that your website is user-friendly. I’m not going to lie, strong visual experience intrigues me. Sometimes I think I don’t have to travel to all places in the world to see something amazing. Just seeing a great visual element “carved” in a single touch of skilled photography makes me feel like I was in there for real. The same thing applies to hero images on a website. By focusing on a great visualisation of an image, you can help your visitors understand you more and encourage them to stay on your website. Aside from that, large images can help visually tell your story without having to depend on just text. That being said, large images may be hurting your website’s loading time, so make sure you consult to your web designer to make the hero images you are using become responsive and user-friendly. In this modern world, we may have seen many websites using background video to enhance more visual experience for their website visitors. A background video can serve as a brilliant way to get the visitor more engaged to click-through to the main video. With a background video on your website homepage, you will not only entertain your visitors from the moment they land on your page, but you can also help your visitor understand the key important points about your company without them having to read every single line of text. It is like you are already communicating with your visitors with the video. Again, putting a video on a website needs to be carefully and properly executed because size matters. If you want a user-friendly website, make sure you consult to your web designer first. Those three are the most eye-catching web design elements for me. Whenever I land on a website page and see those elements, I always feel hyped up about the website and stay longer than usual because it is so interesting. A website is like the bridge of communication between a business owner and a consumer. Therefore, do all the best to provide a high quality website both in terms of content and design. If you don’t have a special web designer yet, you can contact us now and let our creative designer team assist you with your website and your business. This entry was posted in Article and tagged agency, article, branding, business, content, design, designer, developer, development, ecommerce, google, marketing, Melbourne web designer, online, search engine, search engine optimisation, search engine optimization, SEO, SEO agency, seo services, social media, tips, web design, web designer, web developer, web developer agency, web development, website, website designer, website development on January 25, 2019 by Mario.